The Johnson Place guest house is the original house on an historic 1,200-acre ranch located near the site of the second Crow Agency. Straddling the valley of the East Rosebud River, the working cattle ranch is comprised of irrigated hayfields on the valley floor and range on the hills on each side of the valley. Wildlife abounds: mule deer, whitetail deer, bald eagles (during winter), golden eagles, sandhill cranes, great blue herons, foxes, and coyotes are some of the species frequently seen. The East Rosebud is a fine trout stream, and guests are invited to fish and hike on the ranch. Some bring their own horses (boarded for a nominal fee) to ride the miles of trails on the ranch. Both hikers and horsebackers can reach many of the trailheads into the Absaroka/Beartooth Wilderness area just a half-hour drive from the ranch. We can also arrange hayrides, horseback riding, and whitewater rafting through local outfitters. 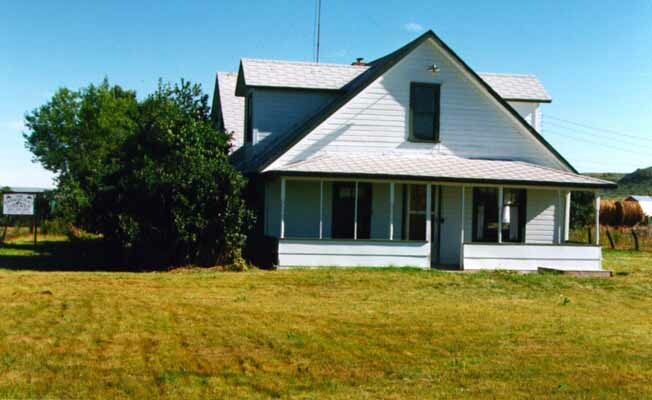 The house itself is a spacious ranch home, originally built by Emily Aadland's grandfather Magnus Johnson, when the area opened for settlement in 1893. Its log cabin and adobe heritage are still in evidence by the thick walls and window sills in the kitchen area. Completed as a frame structure in subsequent years, the house has been thoroughly remodeled and contains a large kitchen with a picture-window view of the Beartooth Mountains to the south, three large bedrooms, two bathrooms and a huge living room. All cooking utensils and appliances, microwave, and clothes washer and dryer are included.